Baader Planetarium has added a unique innovation to the laser collimator. The Laser Colli incorporates a viewable etched viewing plate which can be seen through the back of the laser collimator. This permits collimation of SCTs and small diameter closed tube Newtonians, instruments that were difficult or impossible to collimate using a conventional single beam laser collimator. Each collimator is individually lathe aligned for accurate collimation. The one-piece die-cast and machined aluminum housing guarantees a stable alignment. The compact size and lightweight make the Laser Colli an indispensable tool that is handy to keep in anyone's eyepiece box (thought we doubt too many will find use as a keychain..). Important note: If you plan to collimate an SCT with the Baader Laser Colli, please note that this requires you to center-dot the SCT secondary first. Please read the instructions (below) before ordering this item and before attempting collimation to make sure you are comfortable doing this. For detailed instructions (pdf file) on how to collimate SCTs and Newtonians with the Laser Colli, please click here. This is easily the best laser collimator I have used. It is well made and gives consistent results. I found it extremely helpful in collimating a mak-newtonian that arrived well out of adjustment. Well made, easy to use. Made collimating my Newt a snap. Review by Adam_Mizer of Boise, ID. 5.0 Fine built precision device. Used this product on my Celestron SCT for secondary alignment check and it also showed me my original diagonal was way out of alignment. It can be of use in any way you can get a deflection of beam back to its source. It is a simple aid to help maintain some critical alignments of glass/lenses. Review by Josce of Canada. Very satisfied, and quite accurate! Review by Data-Plumber of Hawaii. Thus thing uses three microscopic watch batteries that are nearly-impossible to get lined up and installed in the collimator. Not to mention being a hard-to-find battery. And not having the laser target tipped 45 degrees makes it hard for one person to use it to collimate a big scope. Review by Fabián De Guida of La Plata Buenos Aires, Argentina. Review by Burak Yakut of Turkey. This is a perfect laser colli for my f4.7 newtonian telescope. And very solid. Review by Boris of Milano, Italy. 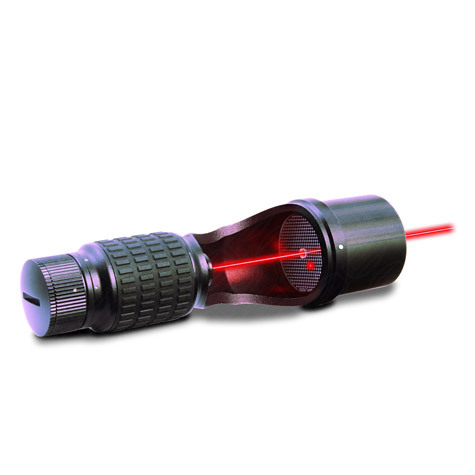 Simple laser collimator. Can be used also with SCT scopes. Review by Keith of Dubai, United Arab Emirates. Do yourself and your Newtonian a favour by keeping your mirrors inline. The assurance provided by accurate collimation guarantees that your viewing experience is as optically aligned as possible. With fast, large Newtonian telescopes the potential for misalignment from seemingly small knocks and bumps is high. A quick collimation check using this uniquely ergonomical device is invaluable.